Here’s another sample of a reader’s ventures in hand embroidery. Margaret Cobleigh is a regular whiz when it comes to improving embroidery kits! And this one is really breathtaking…. Not long ago, I received an e-mail from a reader regarding working kits. She asked if she was allowed to change the stitches or the threads, if she wanted. At first, I assumed she might mean that she was using the kit for instruction in a group or guild project, so I suggested she contact the designer. But it turns out, she just wanted to know if it was right to make a change from what the designer or publisher intended. (She didn’t like the threads or colors and she wanted to try some different stitches). To all such questions, I send out a resounding YES! If you’re working a project from a design or kit that you purchased, and you’re working the project for your own personal pleasure, it stands to reason that you can make adjustments that you will find pleasing. In fact, many of the embroidery kits found on the retail market are indeed sub-quality, in my experience. I’m not talking about kits by designers such of Tanja Berlin or Trish Burr, or even specialty kits found in local needlework shops. I’m talking about those “brand name” kits (Bucilla, Leisure Arts, etc.) that are widely found in hobby, craft, and sewing stores, and that often leave the stitcher feeling a bit stunted when it comes to creativity. Sometimes, too, such kits – especially put out by lesser-known companies – will offer threads that are not the best quality. I remember, for example, getting a crewel kit years ago that had “crewel wool” included in it. Now, Appleton crewel wool is fine. And it’s not expensive. But the stuff in this particular kit was bound with a white band that read “wool” – nothing else – and the wool itself was over-fuzzy, and within few a few stitches began to fray apart. It was awful! Needless to say, I changed it! Don’t be stunted by the limited scope of a kit. If you see a kit you like and you want to try it, go for it! But if you find it isn’t meeting your expectations – either in choice of color, materials, stitch suggestions, etc. – feel free to make some changes! In that way, you personalize your work, too. Margaret made some vast changes on this particular tea cloth, which is a Fleur d’Lys kit from Anchor, titled “Spring.” I have the same kit, but when I first got it, I had a really hard time getting into it, because I didn’t like the color and stitch choices. Well, Margaret had the same difficulty, and she overcame it. It’s difficult to tell you the thought processes that go on when making changes in a piece of embroidery, so with this in particular, to show you the specific changes Margaret made, I’m sharing with you (with her permission) the PDF file that she sent me, taking me through all the changes she made (with photos!). You can click on that to get a larger version. Compared to Margaret’s finished piece, the original is flat and really boring! Margaret added real depth and life to the whole thing by changing the stitches, adding more stitches in some motifs, and by adding more shades of color. The whole piece has really come to life! 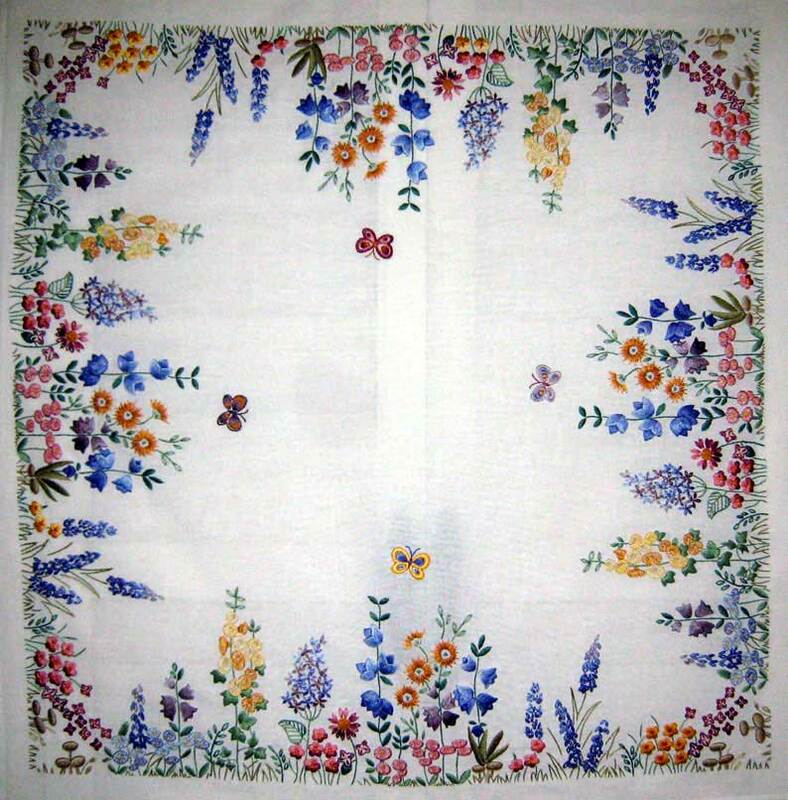 Margaret mentions in her article another tea cloth from the same company – the Strawberry Tea Cloth. Do check out her photos of that piece, too – it’s really pretty! Thanks, Margaret, for sending along the information! I hope everyone enjoys it, and I hope it gives you some creative motivation to make changes in your embroidery pieces if they aren’t measuring up to your expectations! Gorgeous! Working from a kit is like cooking from a recipe. Experimentation is always an option. A fantastic result! She should be really proud of herself. Thank you so much for the video tutorials on embroidery stitches. They have been very helpful for a beginner. Margaret has done a gorgeous job! I read her PDF. Well done. Margaret turned what could have been a “oh, that’s nice” project into a real stunner. What a fantastic piece it is now. Oh my heavens, that is just gorgeous! Hi Mary, and thank you to you and Margaret for sharing this with us. May I take this thought on a little and share that I have often wondered how to go about designing my own pattern to embroider. I’ll clarify this. Some years ago, 7 years to be exact, I decided to do an embroidered picture for my baby niece. But trying to decided what to put in, and which stitches to use really wore me out and made me tired to the point I kept putting it away. It is nearly finished, as I only have 1 section of flowers and leaves to finish. My question is, how do you stave off the boredom and mental fatigue that comes with trying to work out which stitches, threads and colours to use?? Oh, I think this is a question of temperament. I like that part of the process! I like stitching better, once everything’s worked out, but I like the figuring out part, too. Now, if something is too repetitive, I get bored with it, and I like projects that I can see fairly quick progress on, or that have various different things to stitch (or stitches, or threads, or colors) to use. If something is really repetitive – same thread, same stitch, same motif – I have to put it aside and go to something else, then go back to it, then take a break, etc…. It’s always good to step away from a piece of work that’s tedious, just to get a different perspective and to come back with a fresh outlook…. But as for color selection, stitch selection, and so forth, I find that part kind of fun! Marian, I second what Mary said. You might also try starting small. By that I mean don’t try to do too much at first. Keep it simple. Also working on a physically small piece might be easier than attempting a large project. As for boredom, I usually work on 2-3 pieces at a time so I stay interested. I also give myself permission to not finish a project that I don’t like or am not enjoying. Life’s too short! Thank you to everyone for their kind words about the teacloth. I enjoyed ‘messing’ with this kit and I’m really pleased with the results. would it be possible to do an instructional article with pictures on shading? i have seen some many fantastic results on different projects yet i dont know how to attempt it. Margaret, thanks for sharing your process on stitching the tea cloth. I learned a lot about enhancing embroidery projects. I seldom buy kits. I can never seem to follow a pattern so buying a kit is a waste of money for me. I love to take a pattern and make it with my own interpretation. thank you both for your kind words of encouragement. I think boredom, and the pressure to finish, was a large part of why the picture is stil not done. I am now hoping for rain on Sunday, so that I can get on with it. I will post pictures when I'm done. How beautiful! Thank you so much for keeping the old posts available – I am a new subscriber and LOVE going through your articles! Do you happen to know the kit number used in this piece? I would like to find the pattern, if it is still available online somewhere. Thank you for this awesome site, Mary! Beautiful work . Where can I get a diagram for embroidery? Have a great day, and happy stitching! Todo sta bello. Parece q esta hecho sin q manos humanas lo tocaran. La felicito. I wrote in spanish. Thats my language. I live in Miami,Fl.Thanks for your embroidery. I am a cuban.